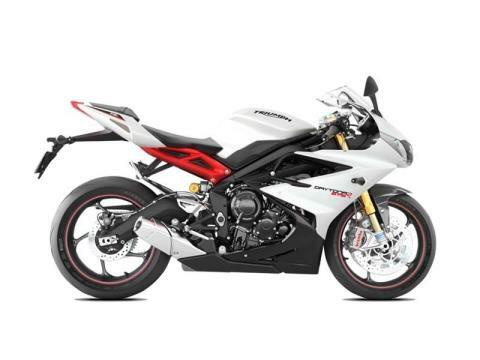 In the Daytona 675R, we’ve made exceptional the new standard. This is a true track day tool. Focused. Committed. Taking our experience gained on track and road with the outgoing bike and combining the latest developments in engineering technology and thinking, we’re giving you an even faster, better handling, and easier riding bike. The result is a bike which is 2.2 pounds (1 kilogram) lighter than the old model with a new triple motor that delivers even more power all the way through to 14,400 rpm redline. The new frame geometry, mass centralization and race-derived Öhlins suspension enables razor sharp handling and confidence-inspiring feedback. Add Brembo brakes, a quick-shifter, carbon trim and some subtle styling details and you know you’re riding a true thoroughbred motorcycle. Frame: The new Daytona 675R frame is made from 8 castings. That means fewer welds and a lighter construction with no loss of strength or stiffness for a more focused ride. The swingarm pivot position is adjustable so you can tailor the handling more precisely to your riding style and the conditions. 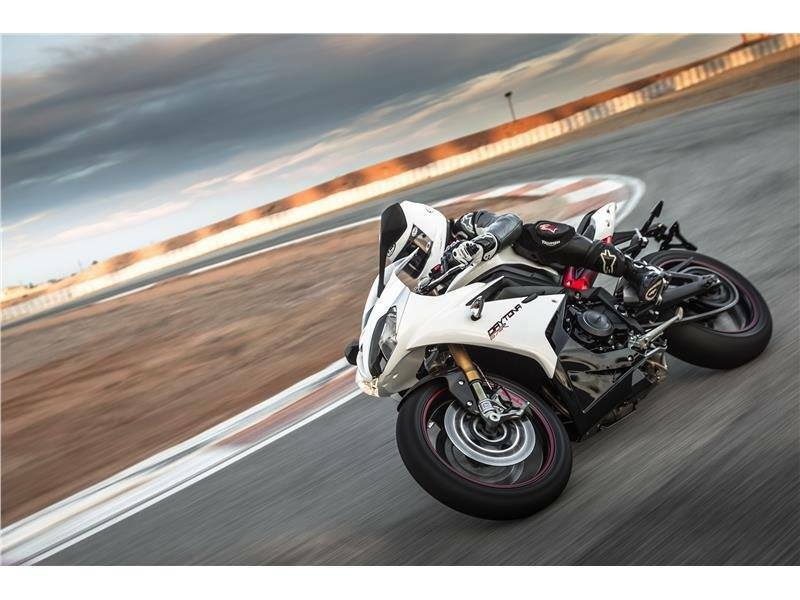 Suspension: We fitted the 675R with Öhlins NIX30 forks for reduced friction, finer damping control and a wider range of adjustability compared with the standard equipment. The rear shock is an Öhlins TTX 'twin tube' unit that delivers more consistent and predictable performance on the track and is easily adjustable for spring preload, ride height and rebound and compression damping. Swingarm: The 2013 Daytona's new rigid aluminum swingarm was designed asymmetrically to make room for the improved exhaust system. You can now even adjust its pivot and personalize the bike's geometry, fine-tuning it to suit your riding style and conditions. Brakes: We fitted the 675R with the latest Brembo monobloc front brake calipers in place of the standard bike's Nissin units as they are especially resistant to heat fade. Being machined from single blocks of aluminum rather than 2 sections bolted together, you also get increased strength and reduced distortion under the extreme pressures of heavy braking as experienced in track use - which in turn improves feel and feedback to you, the rider. Wheels and Tires: Shaving weight off a bike shaves milliseconds off a lap time. So we reduced the 675R's wheel weight because, with their gyroscopic effect, weight lost here is like eight times the weight lost elsewhere on a bike. We fitted new wheels with the new rear being 0.5 kg lighter than the outgoing model. And Pirelli Dragon SuperCorsa tires for optimum performance. Steering Damper: The Daytona 675R is fitted with new, state-of-the-art KYB center-fixed cartridge forks that use an internal damping cartridge which is rigidly located at both ends, rather than floating at one end as in conventional designs. Because it's supported by thinner walls, it has more room for the damping piston, so a larger diameter one can be used, improving damping accuracy. Riding Position: We have improved the 675Rs riding position by raising the bars slightly but with a 10 mm reduction in seat height. Every bit a focused supersport riding stance, designed to get the best out of you in track conditions. Details: High-spec carbon fiber cockpit infills and front mudguard - light and strong. At the rear, a styled hugger sits neatly on the swingarm. Looks fantastic and keeps the dirt off your Öhlins suspension. Mass Centralization: By relocating the silencer to under the engine, rapid direction changes are now more fluid and more controlled. Rider input is rewarded with an incredibly controlled response. Concentrating as much of the mass of the bike at the center has increased the Daytona 675s agility and grip, so you can achieve higher lean angles through the corners. And you'll find that the bike now responds even more readily to your input through the handlebars. Construction: The 2013 Daytona 675Rs engine was even more focused. We built it with a new shorter stroke and wider bore dimensions for even more usable power and acceleration. The cylinder block is now cast separately from the upper crankcase to cope with higher pressures, more torque and more power. 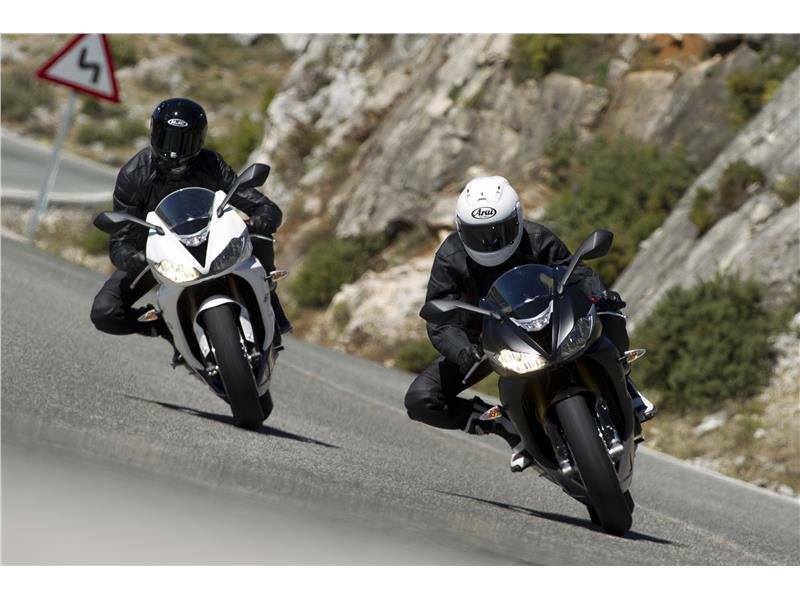 In addition to the 675, the R now comes with a quick-shift gear change, reprogrammed in 2013 to give you even faster, smoother shifting. Internals: With twin injectors per cylinder the new Daytona can draw more fuel quicker when you open the throttle fully and demand more from the engine. A first for a production Triumph, we have now fitted substantially lighter titanium valves to cope better with the higher revs. This also means lighter valve springs can be used, reducing valve train wear and friction. We also knew that the weight reduction was enough to give us the space to add some metal to the valves without compromising the valve train, so the top of the valve 'mushroom' heads were reshaped to improve gas flow around the valve and into the combustion chamber. This means better efficiency and a boost in torque at low and medium revs. 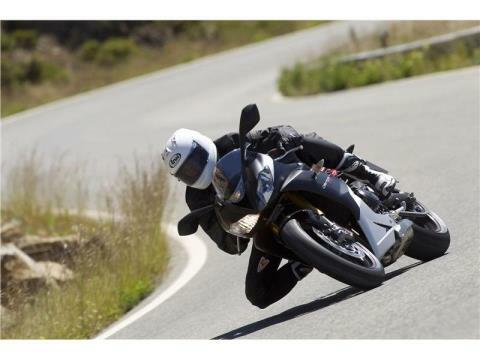 Sound: We enlarged the through-airflow headstock so that the intake mouth is positioned in the highest pressure zone centrally at the front of the bike. Improving flow efficiency, so that air passes in a straight line through the center of the headstock to the airbox. And when the air passes through the center of the cockpit zone, it gives you even more of that distinctive 3-cylinder intake snarl. And it's not just the volume of the sound that’s better, it's now there over a much wider range of revs for an even more focused, involving ride than ever before. Performance: The overall theme for this bike is more torque, better acceleration and more usable power. One of the main contributors to this is the improved bore and stroke. We built the latest Daytona 675R with a shorter stroke allowing us to set a 500 rpm higher rev ceiling at 14,500 and we increased power to 128 PS and maximum torque to 74 Nm. So the new engine now gives you higher power for longer. Wringing even more performance out of the bike as well bringing more of the rider out of you. ABS: The very latest switchable ABS system is fitted, weighing just 3.3 lbs. (1.5 kg) and having a track setting which allows rear wheel drift. The system allows more aggressive braking in good conditions meaning that ABS will only activate when crossing wet surfaces or the side of the track. It works so well that, on a perfect track day, you won’t even notice it. Slip-assist Clutch: The new clutch design increases the friction so that lighter springs are needed. 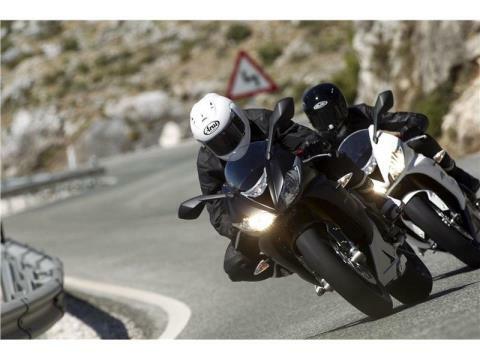 This reduces the effort needed at the clutch lever, making life easier for you around the track. Quick-shifter: Get the real race feel with clutchless gear changes without even having to back off the throttle, maximizing acceleration. 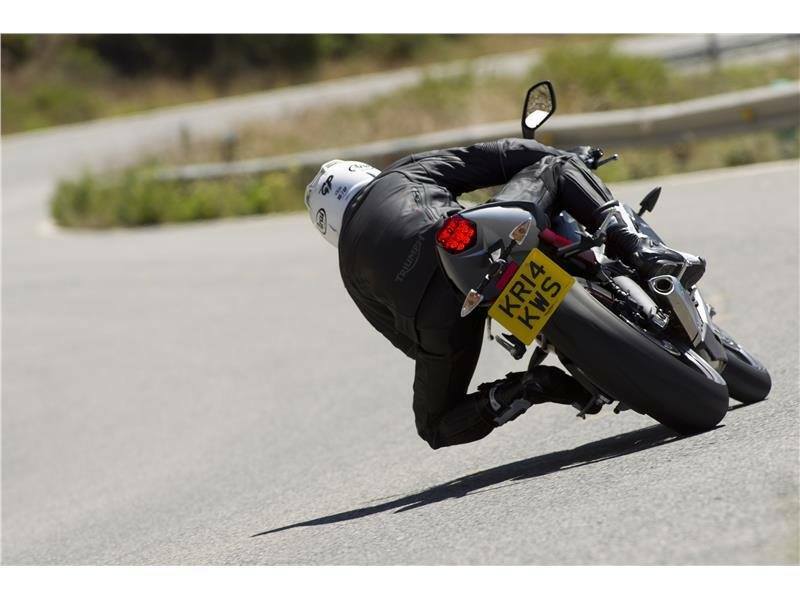 Removable Number Plate and Indicators: As with the 675 you can remove the already slender number plate and rear indicator mounting by simply removing 3 bolts, just for track day use. Programmable Rev Lights: Programmable gear change indicators let you manually set up where in the rev range you want the lights to come on and prompt a gear change. Instruments / Computer:	The Daytona already had a lap timer, 2 trip computers, gear change indicators, shift lights and a clock. Now, the 675Rs instruments are also configured to show fuel gauge, tire pressures (where optional tire pressure monitoring system is fitted) and ABS switching. So you know more of what’s going on as you ride. 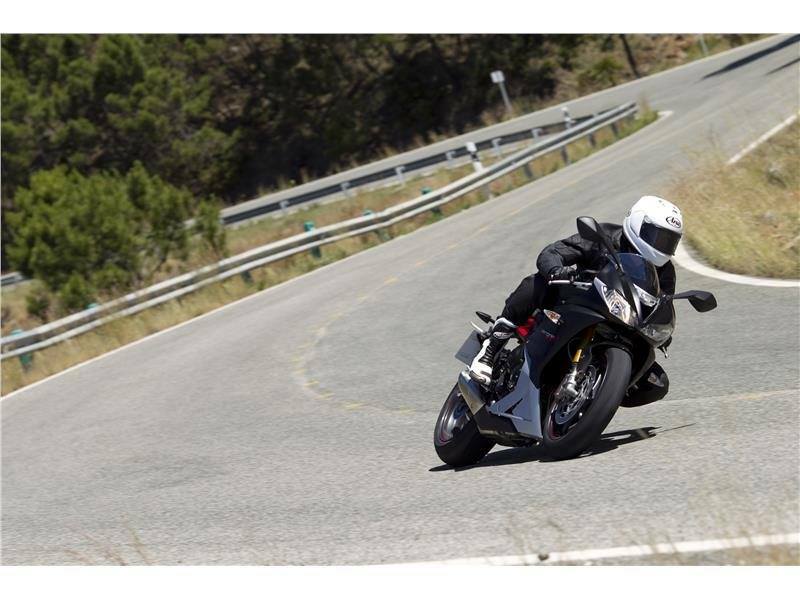 Immobilizer: To protect your Daytona 675R from the wrong kind of attention, we’ve added a high technology security system. It detects a microchip in the key body and if it's not present the ignition system is disabled. This prevents a copy of the correct key being used to switch the bike on. 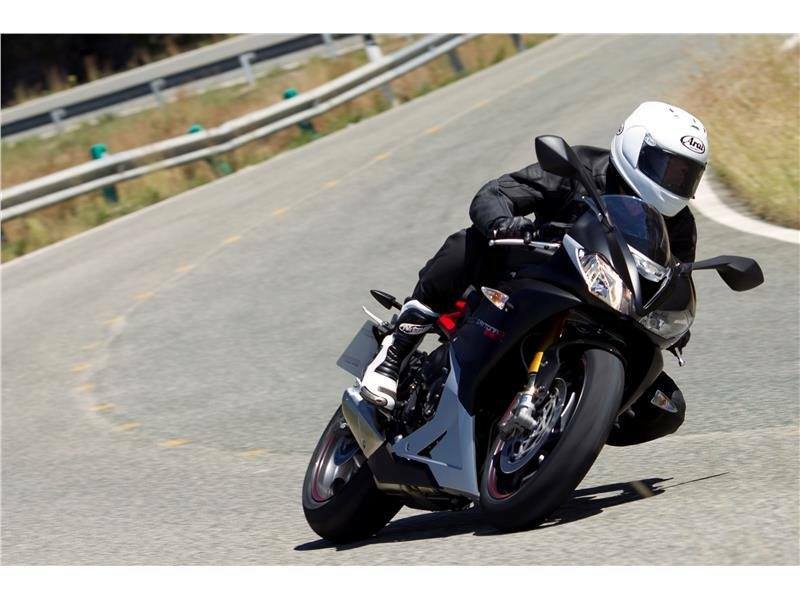 Optional TPMS: Especially on a bike as track-focused as the Daytona 675R, a change tire pressure can alter handling dramatically. Our tire pressure monitoring system will let you know any change in pressure before it becomes an issue.